I LOVE this time of year! We had a wonderful Thanksgiving with the best family in the world and the most FABulous food. I had the honor of cooking the turkey this year. My very first time, and as scared as I was that I was going to ruin it...it was wonderful. You would have peed your pants laughing listening to my phone call the night before asking my mother why on earth she dropped that turkey off at my house?! Thank goodness for foodnetwork.com. LOL! So in all, I did the turkey, stuffing, and potatoes...and as usual, all of the pies. I couldn't have asked for a better day! It's tradition for us to put up our Christmas lights the day after Thanksgiving, and this year was no exception. Jason got all of the Christmas lights up and they are FABulous, he always does such a great job. I will post some pics tonight or tomorrow. I just love coming home after work, turning the corner onto our street, and seeing that winter wonderland all lit up. Well as close to a winter wonderland as you can get in Florida. ;o) Today we will put up the tree and I will do some more decorating in the house. That always seems like a never-ending job. I hate when it's time to take it all down. But for now, I will enjoy it...and I will leave you guys with a couple of goodies we did at club last week. You guys know I don't do too many scrap book layouts...I just don't feel like I'm very good at them. They are always a struggle for me, but hey, everynow and then I give it a go. ;o) The picture is actually a bit old, of my oldest, when we were visiting PA for x-mas one year. I've always loved the set of photos we got that year while walking through the woods at my in-laws. And this little tile uses Stampin' Up! 's Glassy Glaze Enamel and the Dasher stamp. Simple and elegant. 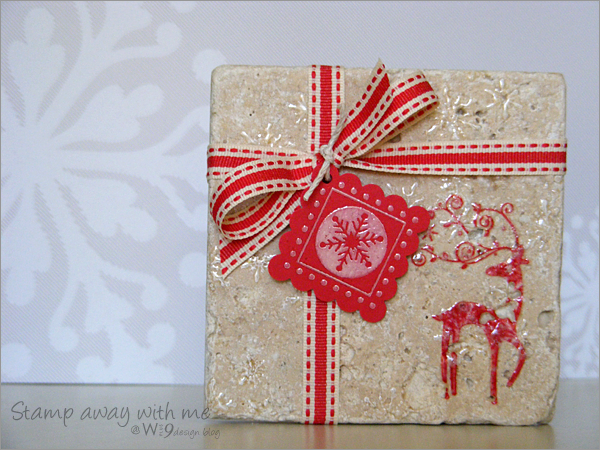 I stamped the image, covered with glassy glaze and baked in the oven. There are a ton of tutorials on various blogs if you've never seen this technique. It's been around quite a while. And finally, another fun tag. Check out that layout, it is just begging to be used over and over to make a set. Don't you think?! And...it's not too late to join in the Tag It Challenge. There are such great ideas out there for tags! Thanks for stopping by, and I hope you are having fun decorating for "the most wonderful time of the year"! Sorry I was so quiet this weekend. I did make a lot of progress, but not on anything I can share just yet. ;o) So the challenge this week over on the Cards Blog is to use buttons, at least 5, the more the merrier. Now I snuck in there just at 5. I'm telling you, I tried to fit more in there, but it just kept throwing it off balance. So I left well enough alone. 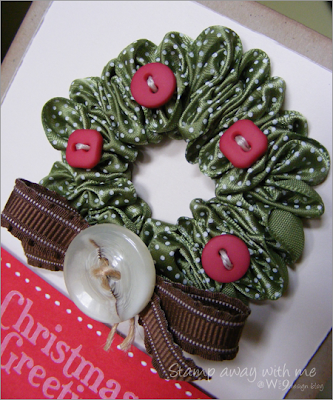 I created the wreath using a wide ribbon and using my ruching technique. I found a little variation however...instead of doing a running stitch straight down the middle of the ribbon, I did it in a zig zag from side to side. What do you think? I was really happy with how it turned out. 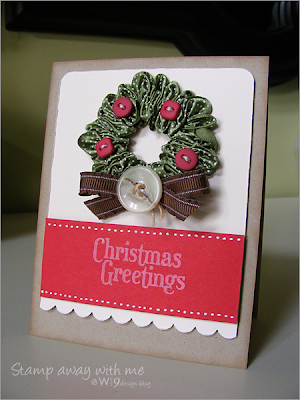 I added some buttons and a bow to the wreath, and a sentiment in a vintage font. Here's a close up of that wreath so you can see the detail in that ribbon. Dreamy I tell ya, just dreamy. Buttons: Papertrey Ink; Stampin' Up! But seriously, just look at that...how can you not LOVE it? It's just so classically simple and fun. 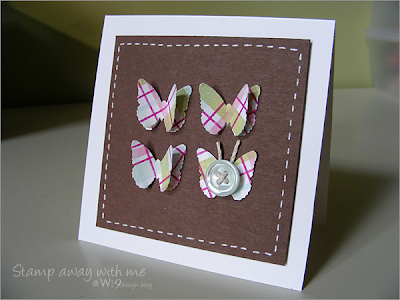 This is a super simple 4 1/4 x 4 1/4 card for Dawn McVey's color challenge using the colors aqua, raspberry, lavendar, moss, and brown. I created the plaid pattern using PTI's Faux Ribbon set (a must have staple set) in MS aqua and moss, and Colorbox chalk ink in raspberry and lavendar. Sorry, but I can't remember the exact colors and I never added the little color labels to the inks. Oops. I've learned now and don't accidentally throw them away. 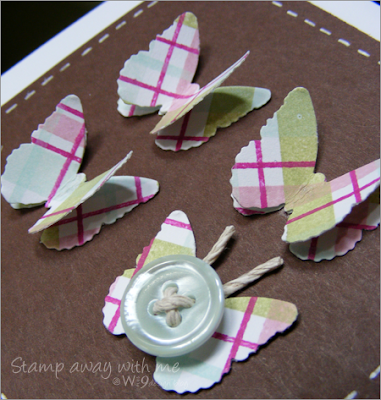 Anyhow, then I used a MS punch for the butterflies, double layered them and added a button to the fourth one. Notice the little anntennae?? That's my ode to Ms. McVey. Just love it when she does that. 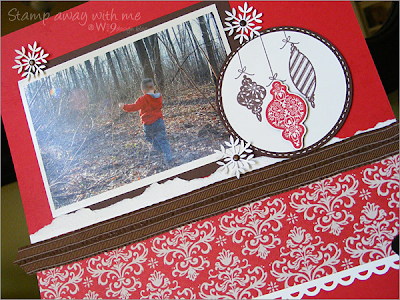 To finish the card off, I added some faux stitching and attached with Stampin' Dimensionals. Hope you enjoy, and thanks for stopping by. Don't forget, there's still time to play in the Inspire Me Challenge. OK...so I got a little carried away. 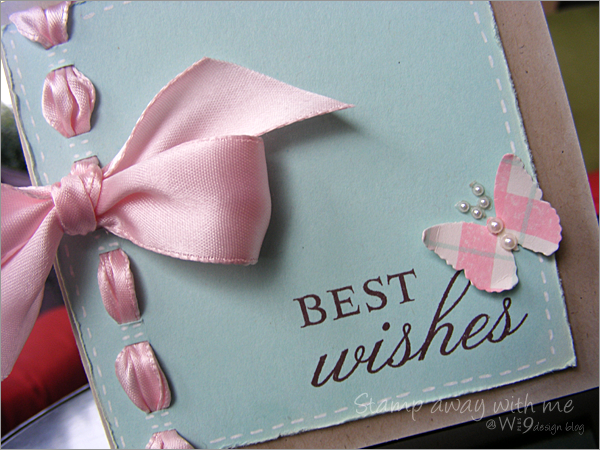 I actually ended up with 2 cards for Lucy's challenge using the colors aqua, pink, and kraft; and combined it with the challenge over at the Cards Magazine blog to use ribbon, the bigger the better. Oh you know how I LAAAUUUV kraft! So this was right up my alley. I just love how the ribbon weaved down the side turned out. I used a border punch by Martha Stewart that punches little rectangles side by side. It just screamed to have ribbon threaded through it. And how about that butterfly?! I told you I was a plaid junky lately. I used the faux ribbon set by PTI to create that loveliness in SU! Pretty in Pink and MS aqua ink on cream cardstock. I told you, I'm plaid crazy! Here it is again this time reversed. (oh and don't worry, I have plenty more color combos to post :0)) I just love naked chipboard, there's just something about it. All it needed was a couple of cross-stitches and some inking around the edges. Hope you enjoyed! Don't forget to check out Lucy's site to see the other fabulous creations. 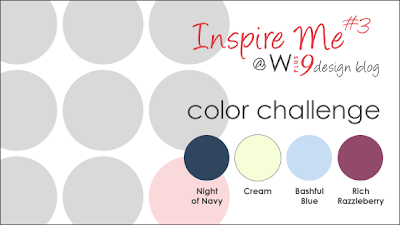 Oh, and if you're looking for another challenge, don't forget there is still time to play along in my Inspire Me Challenge #4. LOOOOOVE those owls! I mean, how friggin' cute are they?! This set is by Hampton Art, and I just have to put it out there...I really like their stuff. Some of my favorite images are from them. So this one is about as easy as it gets. 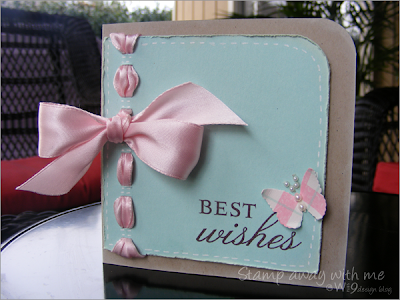 A 3x3 card, cut a little short in the front to accomadate the border punched trim. 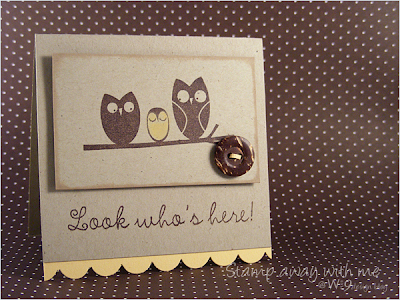 I stamped the image, colored the baby owl with Stampin' Pastels, inked the edges with cream chalk ink (love how the cream looks on Kraft! ), and adhered with some dimensionals. Oh and added a little button with faux thread in So Saffron to match the trim and baby owl. That's it, see, easy right? 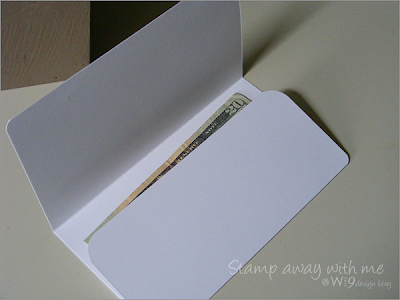 Oh just look at that yumminess disguised as a card! So simple and so fun. This one's a bit different from my usual style. I tend to stay away from dark card bases, but maybe I should embrace them a little more often. I've had those letters for some time now, and then found these little cupcakes from Martha Stewart last week, and it was a match made in heaven! This is a fun little 4x4 card. 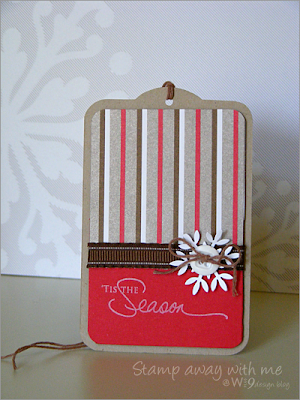 I stamped the top and bottom with the second to largest set from PTI's Polka Dot Basics II. Then I popped the letters, and the cupcake, and finished it off with a fun little ribbon from American Crafts. Oh yes...and you can't forget to round those corners. ;o) Now to find the perfect recipient! Stampin' Up! cardstock in Chocolate Chip and Whisper White. 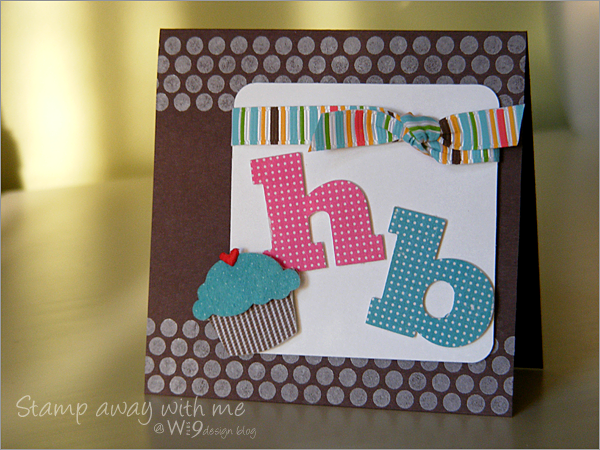 Alphabet die cuts from Colorbok, Cupcake embellishment from Martha Stewart, Stampin' Up! corner rounder. Ok ladies, you know I'm obsessed with tags lately...and it's no fun to obsess alone. So let me see what you've got! You know you'll need them anyway with Christmas just around the corner. 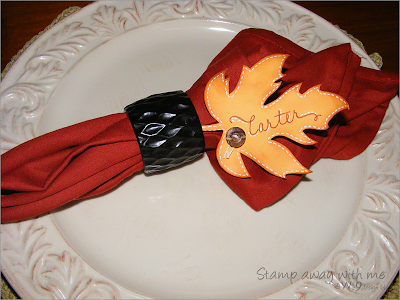 Even a cute little tag to add to that bread your going to bring to the Thanksgiving dinner. The more the merrier! 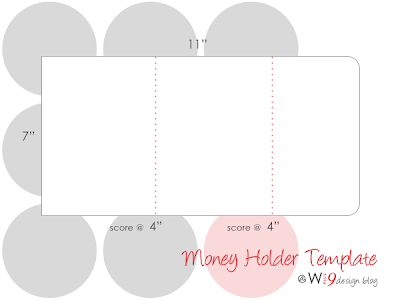 If you don't have any tag die cuts...feel free to download my template from this post. Challenge Details: Post your tag to your blog and then leave a link to the post (not your homepage) via Mr. Linky below, and be sure to link back here from your blog so others can play along. Feel free to use the image above, just right click on it, and select "save picture as", save it to your PC, and then upload as usual. This challenge is now closed. Thanks to everyone who played! Thank you to all of the ladies that joined in the challenge. Boy, choosing just one to CASE was difficult. I think I subconsciously CASEd a little something from each. But mainly, I chose Pam Spiedel's as my inspiration. Now at first glance it may not look like Pam's card was my inspiration. 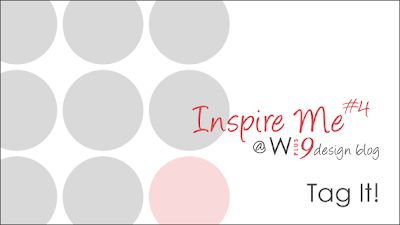 But...that is the beauty of finding your inspiration. The result is not an exact replica, but more of a "nod" to the original inspiration. 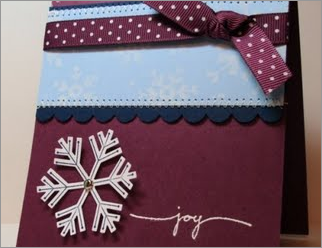 So here's the breakdown: I love the subtle stamping on the front panel with the border punch below, the script font on her sentiment, and the large snowflake as an accent. These are the ideas that I incorporated into my card. I still think it may need some faux stitching though...hmm, what do you think? Thanks for looking ladies and congrats to Dana, who's entry in this challenge was also featured on the CARDS Magazine blog! Sorry I have been MIA this week. It has been a really busy one for me. My youngest had an eye appointment and we discovered that he has 20/30 vision in his right eye and 20/100 in his left. So now we have to get him glasses and he also has to wear a patch over the good eye for 6 hours a day to strengthen the weak eye. Then he started breaking out in hives, and in my inspection of his body I discovered 15 ticks! 15! Poor little man. They were so tiny, about the size of the tip of a ball point pen. Jason and the boys went camping this past weekend and I checked him from head to toe when they got back, but didn't see them. The only thing I can guess is that they were microscopic before they started to feed. Add work to that, and I didn't get any time to craft this week, but I still wanted to share with you guys. I thought it would be appropriate to say a great big "thank you" to those of you that leave sweet comments here and to those that have been participating in my challenges. This one's for you guys. I made this one awhile ago...and I still LOVE it. I was saving it for something special. ;o) As always, thanks for looking, and I will be posting my CASE from IMC#3 soon. Over on the Cards blog the challenge is to create Thanksgiving place cards. 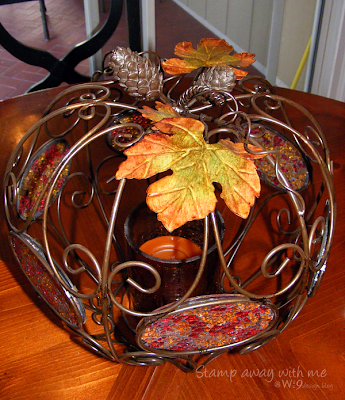 I drew my inspiration from my fall centerpiece on my kitchen table. I love the warm colors and the stained glass panels. You should see that thing glow in the evening with the candle lit. So comforting. 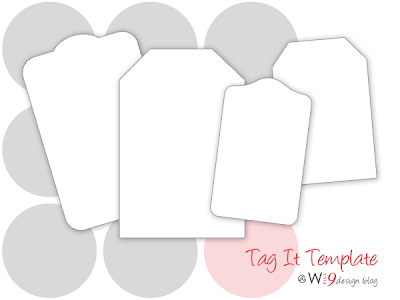 I'm having so much fun creating tags that I thought I'd share my template. I don't have any of the fabulous tag dies out there, so I created my own template. I simply print them out onto cardstock and trim. I've created various shapes and sizes on separate pages so you can print and cut multiples at a time. For the straight edged ones I use the paper trimmer and cut along the lines. If you lack a die for tags like me...feel free to use the templates below. Just click on the image to download the pdf file. There's 4 pages, a little something for everyone! Have fun and I hope you enjoy! With Christmas fast approaching, I thought I'd create a stash of tags. I LOVE tags! Who doesn't? They are so fun to create and you can bust out a ton in no time. Does that color combo look familiar? It should...it's the current color challenge for Inspire Me #3. If you haven't played along, you should, these colors are so fun to play with. 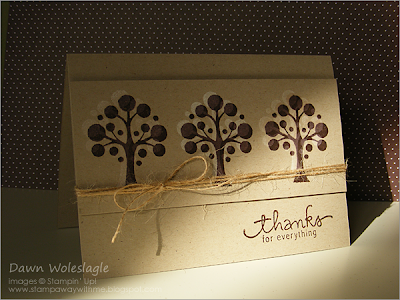 For this card, I used Papertrey Ink's Vintage Cream, SU! 's Rich Razzleberry, Night of Navy, and Bashful Blue. Aren't those ornaments fabulous! They are from SU! 's Tree Trimming Trio. I just love them. 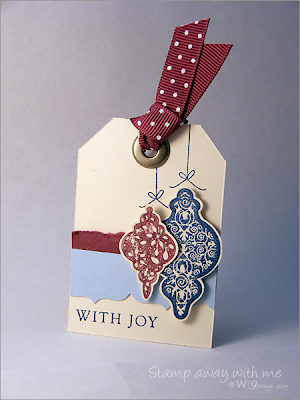 I cut them out and popped them with some dimensionals, and finished the tag off with some Rich Razzleberry ribbon. To save time, I created some tag shapes and printed them onto cardstock and mass cut them with my paper trimmer. Unfortunately I don't have and dies for tags, but this works well for me. Thanks for stopping by and hope everyone is having a wonderful weekend! 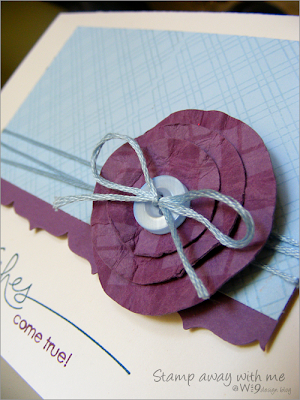 Here are the details: Use the colors above to create a card, tag, scrap page, whatever. I have named them with SU! colors, but feel free to use whatever brand you have on hand. Post your creation to your blog and then leave a link to the post (not your homepage) via Mr. Linky below, and be sure to link back here from your blog so others can play along. Feel free to use the image above, just right click on it, and select "save picture as", save it to your PC, and then upload as usual. The deadline for this challenge is Sunday November 8th, at 9:00 p.m. Sorry, this challenge is closed. Check back soon for the next one! Today's card is one of my personal favorites as of late. I love the clean simple graphic style of this one. I've had those letters laid out for a while and everytime I would pass by them thinking..."I've got to use them on something". And Friday night, it came to me. I was inspired by Maile's paper tearing...she is just SOOO good at making it look perfect. And I just ADORE this color combo! Isn't it soothing? The great thing about this card is it's actually a money holder. And there is plenty of space on the inside to decorate as well. I may have to go back in and "finish" it before sending it to someone. Just have to wait for the right occasion. ;o) I've posted the template with dimensions below.